Publicity Stills of "Open Season"
Director: Jill Culton and Anthony Stacchi. Voice Talents by: Ashton Kutcher, Martin Lawrence, Debra Messing, Gary Sinise, Billy Connolly, Jon Favreau. When a 900-pound domesticated grizzly bear named Boog and a scrawny one-horned mulde deer named Elliot become stranded in the woods during hunting season, it's up to the duo to rally all the other forest animals and turn the tables on the hunters. 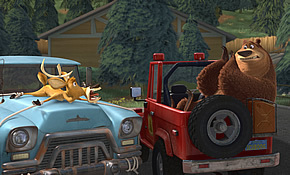 Open Season is the first full-length feature cartoon from Sony Pictures Animation. From the looks of it, Disney/Pixar need not bother about the latest competition. We thought we knew all about domesticated-animals-thrown-into-the-wild from last year’s Madagascar. After all, this year we already have wild animals skimp Over the Hedge invading suburbia and more Happy Feet penguins to come. Not to mention animation features Cars, Ice Age 2, Monster House, Ant Bully and Flushed Away. Why the studio chose to run with another story about a domesticated-animal-thrown-into-the-wild as its first offering is anybody’s guess. Audiences cannot help but get bored if they watch Nemo get lost in the wild every year right? 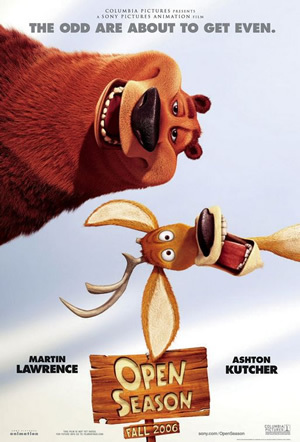 The good news first: Open Season is not all doom and gloom. Judging from the shrill hoots it elicits from the under-12s in the cinema, it definitely appeals to that demographic with its toilet humour. Heck, even the balding guy beside me was chortling at the physical gags and spoof jokes. The movie is visually slick and wondrously detailed; its soundtrack of jaunty ditties and meandering ballads even sound appropriate in the movie. The definitive indictment of the movie’s failure, however, is in its inability to elevate the tiresome storyline to something original. The movie fails because of its cringe-worthy rehashed animation clichés, incongruous set-piece scenes that do not fit into one another, some very forgettable characters and many bad jokes. Rabbit fight jokes work to a certain extent until we recall the dazed, suckered and floating rabbits in Wallace & Gromit in the Curse of the Were-Rabbit. Ashton Kutcher is funny until we turn our attention to Shrek the Third and the Return of King Donkey. The Porcupine is no match for the wire-fu Madagascar penguins. 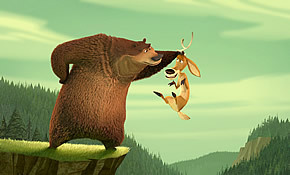 In short, we have seen too many animation movies to be delighted by Open Season. The movie never rises above the messy climatic battle between men and animals in the last part of the story – it is tired, confused and not very laughable.